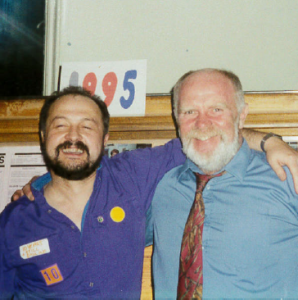 Did you know that Back on Track has been making a difference in Manchester since 1977? Find out how we evolved from a small project set up above a shop into the award winning charity we are today. Just click on the panels below to see what’s behind them – and let the story unfold! Our work is first set up by national charity Nacro as an advisory service for ex-offenders and those about to leave prison. 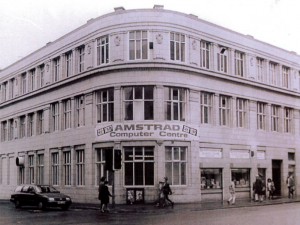 The project’s first home was above a car parts shop on Barlow Moor Road in Chorlton, south Manchester. 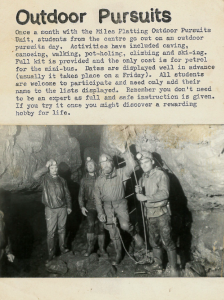 From these humble beginnings the service grew fast, and soon offered a wide range of activities, including music groups, arts and crafts, pottery and even caving! We set up the NACRO Education Centre just off Oxford Road. It soon reaches around 500 ex-offenders each year, and the model is copied nationally with education centres set up in several cities in the UK. Nacro changes its focus nationally and decide to close its education centres. However, the staff at the Manchester centre – David Haley, Malcolm Craven and Linda Brett-Smith – decide to set up a new charity to ensure that the education work in Manchester can continue. They call the new charity Nearis – Northern Education and Advice Resettlement Services. We move into a new home – Swan Buildings, on Swan Street in Ancoats. We’ve been based there ever since. 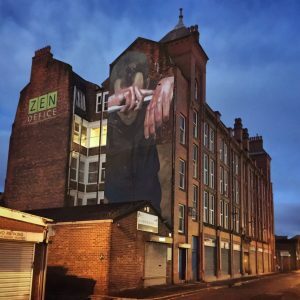 Today the building is famous for its mural, which was created in 2016 as part of the Cities of Hope street art project. It was inspired by our work supporting people with mental health problems, and depicts one of our service users. We change our name to Back on Track, to better reflect who we are and what we do. The new name is suggested by Chris, one of our service users. 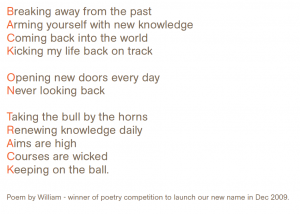 We held a poetry competition to launch the new name – it was won by William, with this clever acrostic poem. We open Swan Kitchens, a cafe in our training centre. 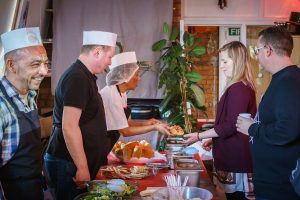 It provides cheap and healthy meals to our service users and volunteers, plus great new training and work experience opportunities. The cafe team soon begin to provide external catering, and in 2017 complete 134 orders, feeding more than 3000 people. So far 21 cafe volunteers have gone on to paid work. 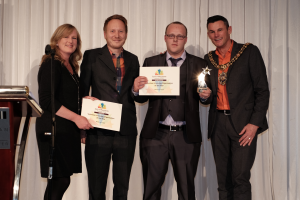 Back on Track win the ‘best volunteer involving organisation’ at the Spirit of Manchester awards. The award is received by our cafe volunteer Darryl from the Lord Mayor of Manchester. We celebrate 40 years of changing lives with an event featuring faces from the past, performances and more. The event is hosted by the Manchester poet Tony Walsh. Andy Burnham, the mayor of Greater Manchester, makes a speech. 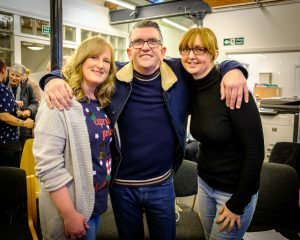 We announce two fabulous new celebrity patrons: Mike Joyce, one quarter of Manchester legends The Smiths, and the renowned Manchester chef Mary-Ellen McTague (pictued with Back on Track Chief Executive Siobhan Pollitt, right).